Karly Matthews has no idea how much truth there is to her statement after she first encounters Thayne Harper at a networking event: She is a medium, struggling to keep her store open after making enemies with a powerful executive set on destroying her career after Karly helps his wife leave him; Thayne is a skeptic, the descendant of a wealthy family in the hotel industry. Both, however, share a sizzling physical attraction for each other, as well as dark secrets that make it impossible for them to get close to anyone. Will Karly be able to keep her heart safe when she is hired to chase away a spirit haunting the bed and breakfast that Thayne is opening, especially when her job forces her to live under the same roof as him? 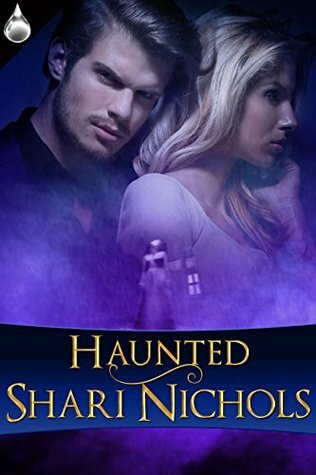 The plot of Haunted, written by Shari Nichols, is driven by a few different story lines. There, of course, is the romantic and professional tension between Karly and Thayne, and with that, many heated love scenes unfold that are sure to make one’s toes curl. Then there are the insecurities that Karly faces, having been in a serious relationship that ended so badly that she is quick to react jealously and expect the worst from men, especially Thayne, who is naturally charismatic and has had a reputation for courting many women. As difficult as it is for Karly to trust Thayne, he also cannot open up to her, having suffered the loss of someone close to him. He is under a lot of pressure to prove himself to his father, with whom he is estranged, by ensuring that his first hotel opening is successful. Unfortunately, a ghost seems set on sabotaging his plans. While the story focuses mostly on Karly, as well as Thayne, there’s a lot happening in the novel, and details that are relevant to understanding their history are vague or not revealed until much later. This makes it difficult to fully empathize with Karly in her hesitation to start a relationship with Thayne. Karly’s fears of falling for Thayne would be more believable if she and Thayne would explain why they have such strong feelings for each other, besides the physical attraction they feel. It is the mystery surrounding this ghost that is most interesting in Haunted. While Karly and Thayne are both dynamic characters who are easy to like, their romance is predictable, though entertaining to witness. The ghost haunting the Molverton Inn is complicated, seeking revenge and, at points, physically harming the people who cross her path. Karly’s job to eradicate such a stubborn spirit is not easy, and Nichols thoroughly explains the different steps a medium must take to protect the property and people, identify the spirit, and guide the spirit onto the next world. The mystery surrounding the identity of the spirit and how she became a ghost makes this book difficult to put down. Haunted has many elements that make this book an exciting read. It is well-written; Nichols describes the characters and settings in a way that flows naturally with the action, and the way she paces the story builds suspense. She incorporates realistic dialogue, and the conversations between Karly and her sister are particularly witty and entertaining. Nichols creates complex characters with unique personalities, and readers cannot help but cheer on Karly in her quest to rid the Molverton Inn of a stubborn spirit and find happiness with Thayne.